Lily wears her extra large ARTsmart custom camp t-shirt as a smock as she paints her “magical unicorn” in summer ARTcamp. Broken Arrow T-Shirt Printing and Embroidery is proud to make custom summer camp T-shirts for non profit organizations and good causes like ARTsmart. ARTsmart is a non-profit organization that serves communities in New Mexico by providing educational opportunities in the arts that promote confidence, self-discovery, and creative problem-solving skills. 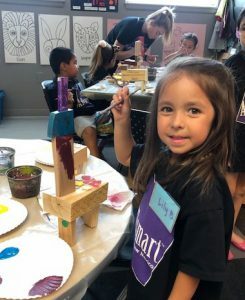 Since 1990, ARTsmart has invested more than $4.5 million for the purchase of art supplies, materials, and art programs for New Mexico children. These art programs include both in-school and after-school programs in the public schools, including the Visiting Artist Program, summer ARTcamps, and the annual Children’s Painted Ceramics Project, partnering with the Youth Development Center, and providing nearly $70,000 in scholarships to deserving high school seniors who are pursuing their dream of making art a vocation. If you would like to support ARTsmart with a financial donation, please visit ARTsmartNM.org, call 505.992.2787 or e-mail tbrown@artsmartnm.org. If your non-profit organization needs summer camp T-Shirts or T-shirts for any event or cause, call us for a free quote. We think you’ll appreciate our high print quality, cheap prices, and free shipping.